Accelerated Bridge Construction (ABC) technologies are changing the ways State Departments of Transportation (DOTs) do business. Most notably, Milbocker & Sons, Inc., along with these technologies can reduce planning and bridge construction efforts by years. The accelerated project times significantly reduce traffic delays and road closures and could potentially reduce project costs. 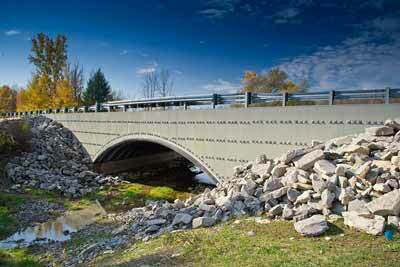 The innovative ABC planning and construction methods, designs and materials produce safer, more durable bridges with longer service lives than conventional bridges. Accelerated bridge construction (ABC) techniques have the potential to minimize traffic disruptions during bridge renewals, promote traffic and worker safety, and also improve the overall quality and durability of bridges. Use of PBES (Prefabricated Bridge Elements and Systems) is one strategy that Milbocker & Sons utilizes to meet the objectives to Accelerate Bridge Construction. ABC improves site constructability, total project delivery time, and material quality and product durability. When started nearly 60 years ago, the company headquarters were located on the family farm. At that time they employed roughly 20 people and possessed fewer than 10 pieces of equipment. Learn more about Michigan bridge construction. Copyright © Milbocker & Sons, Inc. 2019 | All Rights Reserved.